Padi Instructor Courses! If you like people, have a passion for scuba diving and want an extraordinary life – become a PADI Instructor in Cyprus. Teaching scuba diving allows you to share your love for the aquatic marine world with others while doing something what you really enjoy – being in, around and under water. Who knows where your Padi Diving Career will take you next? Europe, Asia or the Caribbean. Welcome to Easy Divers Cyprus. Easy Divers began as a small concern and has grown with a BIG reputation. During the last 20 years in the growing, has made the Busiest PADI 5* Instructor Development Centre on the East Coast of Cyprus. Most of our Padi IDC Candidates have been coming from european countries like UK, Scandinavia and Germany, but we have seen a shift with more Russian Padi IDC students in the last few years. Padi Crossover Courses. To become a padi instructor from another agency like SSI, BSAC, NAUI or DiveRaid you will need to attend a Padi Crossover conducted by a Padi Course Director Like Joey Ridge. They will give you the orientations and knowledge of the Padi System. You will then need to attend a Padi IE to be full recognised and authorised to teach Padi Courses. We are the leaders in Professional Instructor Training, Taking Professional Scuba Diving to the next level. The PADI IDC is just one of our Professional Level Courses. Live-in Scuba Internships for underwater Photographer or diving Videographer, diving compressors and air bank operator, dive equipment technician, visual Cylinder Cleaning Technician and Dive Resort management Training is just some to mention. Give me a call or send me a email to the Padi Course Director for more details. We are proud to have awards and certificates of excellence from PADI and our customers. Our 5 star PADI IDC centre offers courses from try dives through to instructor level. We combine the academics at our centre and the Mediterranean Sea for the practical part of the course, what a perfect way to learn to dive. Join us here in the SUN! Our aim is to make you the best INSTRUCTOR. SO WHY PADI INSTRUCTOR TRAINING with EZ DIVERS? 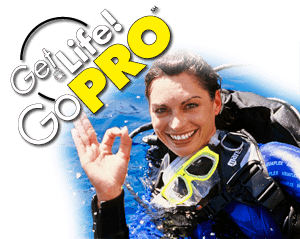 YOUR GOAL IS TO BECOME A PADI PROFESSIONAL OURS IS TO HELP YOU TO BE SUCCESSFUL! Arrive a day early (sooner the better), you will find out that it will save you lots of time and energy for you to participate in the Prep course. You will have an opportunity to meet the Staff, your fellow candidates so that you get to know each other. We want you to relax & enjoy. The Prep consists of organizing paperwork, taking a 5-part theory pre-exam which is similar to the Padi IE exam/DM exam. We will help you to remediate your problems. We will also spend some time in the swimming pool and work on demonstration quality of your skills. We will also help you in you open – confine teaching preparations. Before you arrive at EZ Divers for your Padi IDC in Cyprus. You should have made self-preparations of your own. 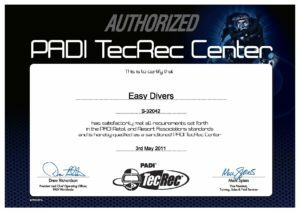 This will significantly lower the Padi IDC course load and stress level for you. Your Padi Instructor Course will actually be more EASY and enjoyable. If you are well prepared. Reading your Divemaster course work, Knowledge Workbook and encyclopaedia will help you loads. Proof of CPR and First Aid not older than 24 months (or take our EFR Instructor Course). Logbook with proof of 100 dives. Please make sure that you can answer all the knowledge workbook questions in preparation, before you start your Padi Instructor Courses! During your Padi Instructor Courses. If you DO NOT have the required materials, we can arrange for your Padi materials to be sent directly to your home or BUY IT here in resort. Tips: Any materials you need can be ordered from us or from our Padi IDC Shop Possible other IDC could be scheduled. Please Call. PADI IDC Staff courses available on all the above dates. Our IDC Preparation Course ( 1 – 2 days ). We would like to invite you to our COMPLIMENTARY Prep course. Candidates taking the PADI Instructor Development Course are expected to have a good knowledge of diving academics and demonstration-quality pool skills. Maybe it has been some time since your Divemaster training or you may have not been active in assisting with classes. Perhaps you are just not entirely confident about your level of expertise. If either of these situations applies in your case, this is why our Padi IDC Preparation Course is a must for all candidates. 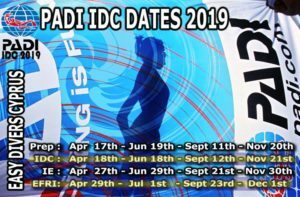 This course will alleviate those fears and will thoroughly prepare you to enter the Padi IDC with added confidence in academics and confined water skill demonstrations. We frequently have Instructor candidates who are not comfortable with Physics or the Dive Tables (especially The eRDP or Physics) or they are unable to perform pool skills to demonstration quality. During the Padi Instructor Courses in Cyprus, we will work closely with you to eliminate your individual on MINOR difficulties, before the Padi IDC begins. PLEASE PREPARE! WE CANNOT TEACH YOU THE DIVEMASTER COURSE THEORY!